All seats reserved at slide show: another outrageous success! Full House at the free slide show! All the seats for the free slideshow have now been reserved. We will arrange another slideshow, probably in the New Year. 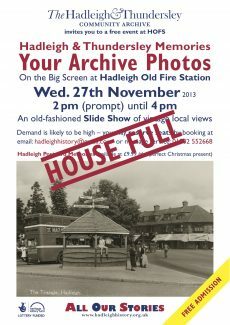 For those with reserved places: the Wednesday November 27th slide show at HOFS from 2 pm to 4 pm is where you can participate to identify people, places and events in pictures from times past. Admission: free! Refreshments: contributions appreciated. and the research and contact work which underpins the archive. Suitable contributions very welcome: It is easy to add to the Hadleigh & Thundersley Community Archive. visit a drop-in at Hadleigh Library to meet an editor.